In this chapter we consider a set of equations with aftereffect and uncertain parameters. As a result of regularization of the family of equations according to the scheme adopted in the book, a set of equations with aftereffect are obtained, for which the solution existence conditions are established, an estimate of the distance between the extreme solution sets is obtained, and stability conditions for the set of stationary solutions on a finite time interval are found as well as the attenuation conditions for the set of trajectories. This chapter deals with the families of equations with aftereffect and uncertain parameter values. 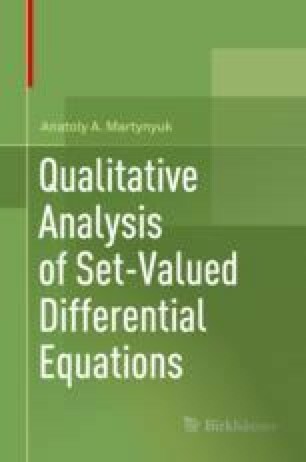 The families of equations with aftereffect are obtained as a result of regularization of equations according to the scheme adopted in the book. For the obtained families of equations, the solution existence conditions are established, the estimates of the distance between extreme sets of solutions are found, and the stability conditions for the set of stationary solutions on a finite time interval are obtained.